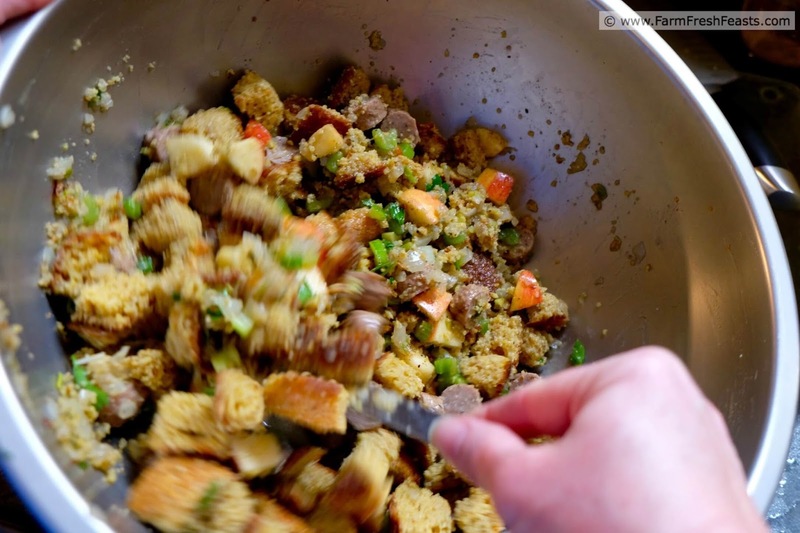 A cornbread stuffing with chunks of apple and turkey sausage along with sautéed celery and onions. If you're using gluten free cornmeal, this is a gluten free side dish for a holiday table. Today you can turn on a TV and see chefs making recipes in well-lit studios right in their own homes. It wasn't always this way. In the 1950's, in Minnesota, watching a food show on Minnesota Educational Television meant a county extension agent coming into the studio to demonstrate a seasonal recipe or new product. Hot lights, unscripted--just wild & wooly cooking on the fly where anything goes. The original Reality TV. I grew up eating "Doc Billings Stuffing" on Christmas day at Mrs. Loomis' home, but it wasn't until I was older that I learned the story behind the name. Eleanor Loomis was a Consumer Education Specialist in the Extension service of the University of Minnesota in the 1950's. She was on TV weekly, sharing buying tips, recipes, and cooking techniques. One week the theme of her show was Thanksgiving, and she brought in a special guest, Doc Billings. Doc Billings was a Turkey Specialist in the Extension service. For that episode she made her signature stuffing recipe--a moist rosemary-scented stuffing with apples and onions. Doc Billings was aghast at how wet her stuffing appeared and threw a handful up the the ceiling. The cameraman followed the action all the way up, lingering on the glob of stuffing stuck to the studio ceiling. Mrs Loomis was mortified, her story became legend in my family, and I've always liked apples and onions in my stuffing. 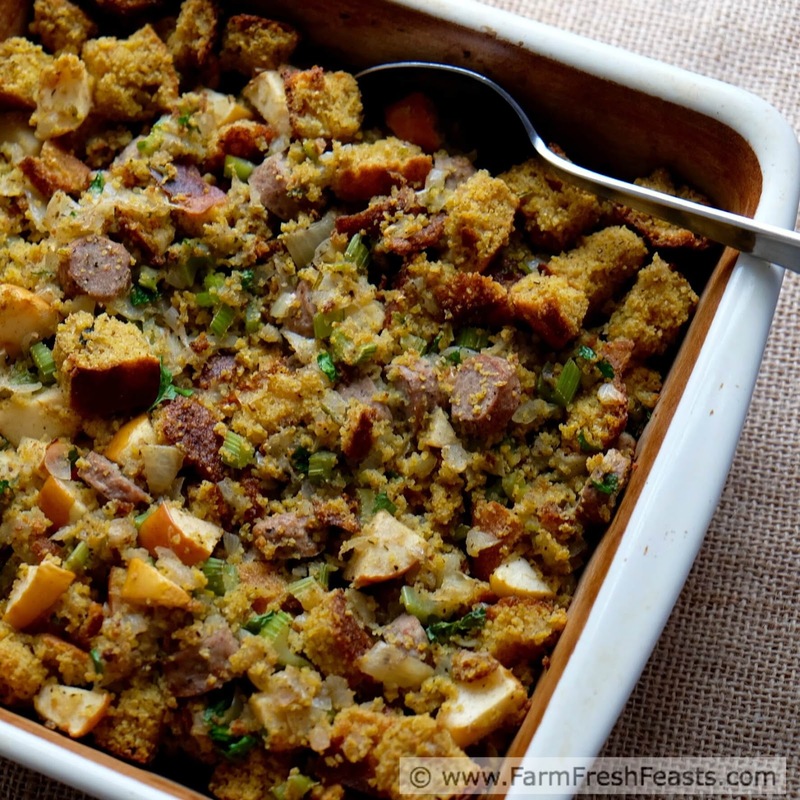 I also like cornbread stuffings, and oyster stuffings, and really I'm just a stuffing fan. Or call it dressing, if you prefer--I don't stuff my bird with it either way. 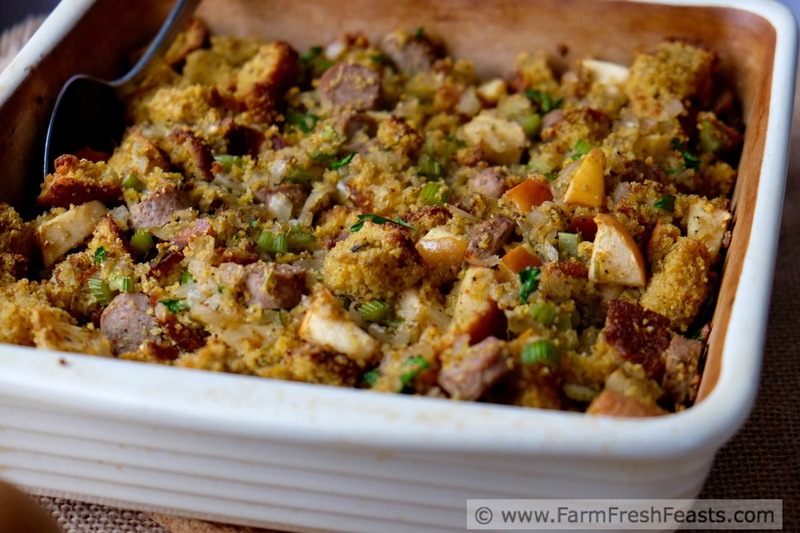 Since I've switched gears to Thanksgiving, I wanted to share a stuffing recipe to go with my other sides like MA's Make Ahead Mashed Potato Casserole. I'll share a new cranberry sauce recipe next, my Semi Homemade Cranberry Sauce with Pineapple and Pecan followed by a comforting Carrot, Celeriac, and Potato Mash. Next, I'll share a round up of Thanksgiving Round Ups. Because I share seasonal recipes, and because I am really slow in the kitchen, I am usually working ahead. 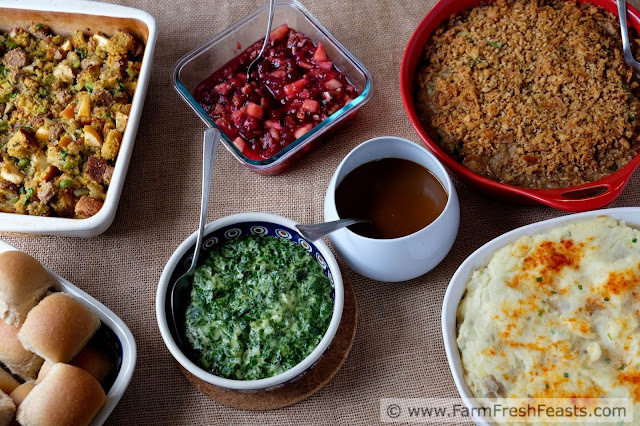 I'm thinking about alternative Thanksgiving ideas [all about making a homemade spread for a small number of eaters]. I've got 11 Tips for a Small Batch Thanksgiving as well as my Dairy Free Small Batch Corn Pudding recipe, my Small Batch Sweet Potato Casserole recipe, and for a sweet finish, my Small Batch Chocolate Pecan Chess Pie. To get you in the mood, here's a round up of kitchen photos from a previous Thanksgiving (we'd had Robert Barker a couple of weeks at that point, so he was quite underfoot). What am I saying? He's still underfoot! For more recipes using apples, please see my Apple Recipes Collection, part of the Visual Recipe Index by Ingredient, a resource for folks like me eating from the farm share, the farmer's market, the garden, the neighbor's garden, and great deals on ugly produce at the grocery store. Note: This stuffing is best (and so is your stress level) if you bake the cornbread a day or two in advance, let cool, and cut into cubes. Leave the cubes in a bowl or tray on whatever random flat surface you have available for the better part of a day so they can dry out a bit (I cover them loosely overnight). I either make a half recipe in my 7 inch cast iron skillet, or make a full recipe and use half of the cornbread in this vegetarian Sweet Potato, Chile and Cornbread Breakfast Casserole and the other half for stuffing. My cornbread recipe can be found in this Tamale Pie with Hatch Chiles post or this Taco Turnip Tamale pie. I do not add additional vegetables (corn & chiles) when using it in stuffing. Yet Another Note: When I am serving this on Thanksgiving, I'll prep the cooked vegetables and cube the cornbread in advance, and mix the whole thing together in a bowl while the Turkey is roasting. After the turkey comes out, I'll transfer the mixture to the baking dish and add to the oven with the other sides. /end Notes. A cornbread stuffing with chunks of apple and turkey sausage along with sautéed celery and onions. If you're using gluten free cornmeal, this is a gluten free side dish for a holiday table. Prep time does not include baking the cornbread. Cut cornbread into cubes and place in a large bowl to dry out a bit. In a small pan over medium heat, melt butter. Sauté onion and celery in butter for 5 to 10 minutes, stirring occasionally, until softened. Set aside. Chop sausage links and add to bowl, along with apple cubes and parsley. Sprinkle poultry seasoning (or equivalent) over top. Add in cooked onion/celery mixture. Using your hands or a spatula, gently combine the vegetables, apples, sausage and cornbread. Pour some of the turkey broth over the mixture, gently stir, and add a bit more broth. I like a moist stuffing, and if it gets too wet a bit more time in the oven will help. Add some salt and pepper, taste the stuffing, and add more if you feel it's needed. Preheat the oven to 375 degrees Fahrenheit (or 350 or 400, depending on the other sides). Butter a shallow pan (I used my 9 inch square baking pan) and spread the stuffing out in the pan. On Thanksgiving, I stick the stuffing, mashed potatoes, sweet potato and green bean casseroles into the oven after the turkey comes out. While the turkey is resting and then being carved, the side dishes get cooked/warmed. 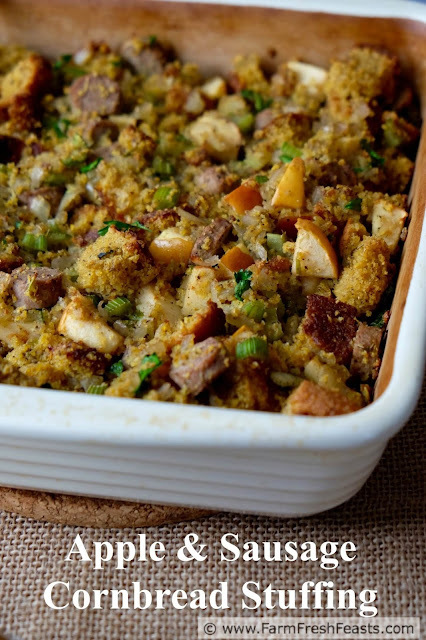 If your oven is at 350, bake the stuffing a bit longer, maybe 40 minutes. If your oven is at 400, maybe it only needs 20 to 25 minutes. Serve warm, with gravy over top. So that story is too too funny! Did your mom do TV? I don’t remember my mom talking about that! Maybe the OCHER ladies should be consulted! PS Am also really keen on your apple idea! Our stuffings aren’t unalike -- though I always use dried bread instead of cornbread. 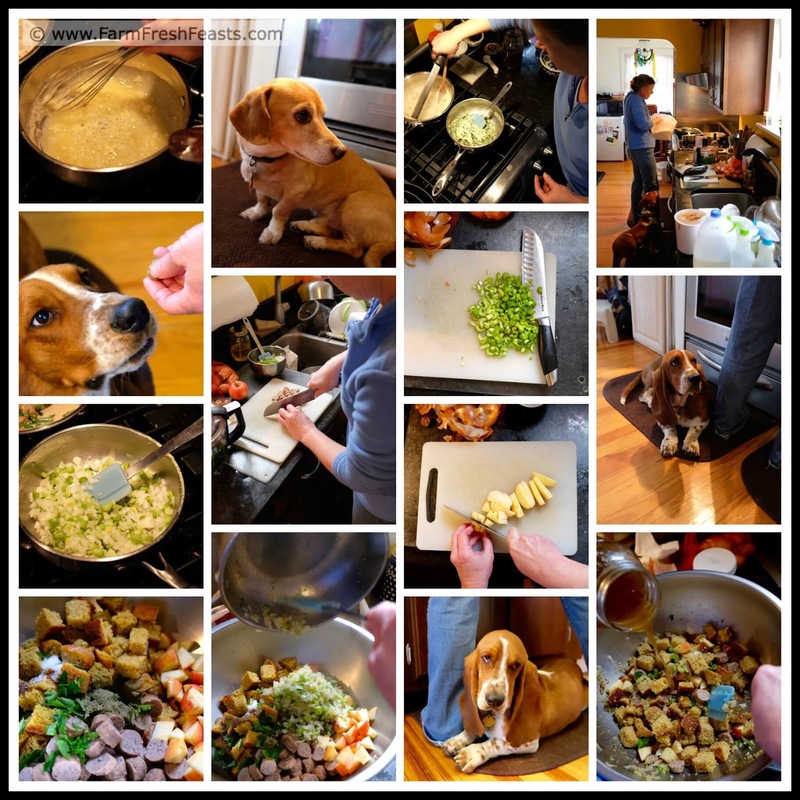 If I were cooking this year (turns out, I’m not!) I’d take my grandmother’s recipe and use cornbread and add apple. So next year, I guess! My mom didn't do TV. Mrs Loomis came into our lives through my Dad--he was her grad student. My grandma used to watch her show, leaning intently towards the TV out at the farm. She even served punch at my folks' wedding! Thank you for consulting the OCHER ladies--we've got such a treasure there.